“Shares in mining companies operating in Peru fell sharply on Monday after a leftwing former coup leader won a narrow victory in the country’s presidential election. Grupo Mexico, a metals mining company with operations in Peru, fell 8 per cent in New York trading. Hochschild, a silver miner, and Southern Copper Corp, tumbled 5 per cent and 11.3 per cent respectively. Shares in Xstrata, which is building one of Peru’s biggest mines, were off 0.86 per cent, while Volcan Compañía Minera, in which Glencore has a stake, fell 8 per cent. 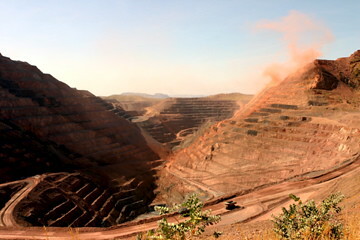 The most active international mining companies in Peru are Xstrata, Newmont, Freeport-McMoran, and First Quantum. The effect of the election results on the stock price of Newmont is displayed below, showing a sudden 2% loss vs. other gold miners. The average stock price decrease of around 10% of Peruvian companies reflects the risk of a tax increase. As the market value is the market’s expectations of future profits, the 10% increase corresponds well with a high likelihood of an approximate 10% tax increase (i.e. 10% after-tax profit reduction) plus the additional risk of increased government control. Besides the risk of tax increase and increased government control, foreign companies face the risk of rapid employment cost increases as the new government will quickly try to make a mark in supporting wage increases.